Sun block isn’t an immediate “fix-all” and not all sun blocks are created equal. 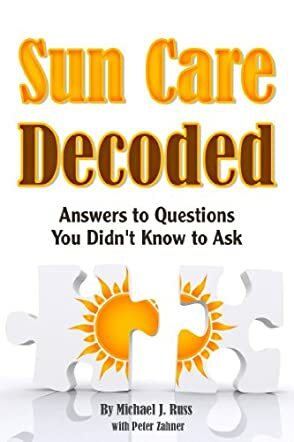 The reader will understand those two concepts and more after having read Sun Care Decoded by Michael J. Russ and Peter Zahner. Most people simply assume that sunscreen is safe and that a higher SPF is better and they use it liberally, without having any idea that there are negative consequences. The active ingredients are meant to block out a particular type of UV rays which cause sunburn and stress on the skin. The majority of the active ingredients used are chemical. Michael and Peter help the reader to understand the different types and the possible side effects that each can have, as well as the benefits of naturally derived sunscreens. He also gives guidance concerning using sunscreen with children and babies. The author also addresses how antioxidants help prevent sunburn and the aging of skin, as well as the benefits of sun exposure and the effects that it can have on one's overall wellness. Sun Care Decoded is an excellent guide to understanding how to properly use sunscreen and which products are beneficial or harmful. Michael J. Russ and Peter Zahner have laid out a format that is easy to follow and easy to reference at a moment’s notice. In the madness that followed the “sun block” trend, Sun Care Decoded”is a voice of reason that helps give guidance to the reader. Informative and honest, with easy to access information makes Sun Care Decoded the “go to” guide for the proper use of sun screen and overall skin care.